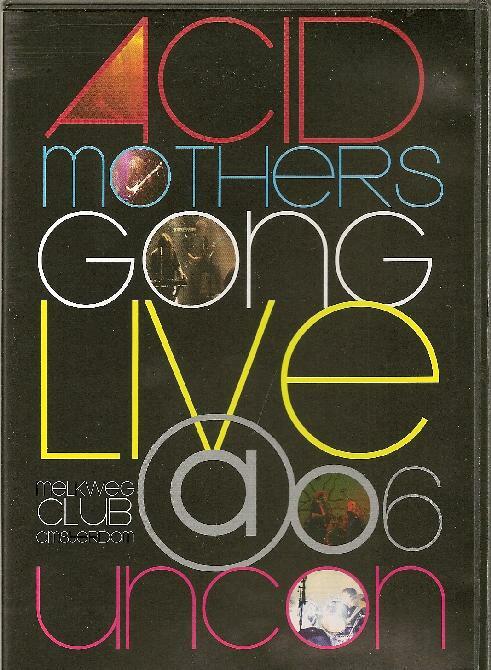 Acid Mothers Gong - "Live at Uncon 2006"
Daevid Allen and Gilli Smyth of Gong with Acid Mothers Temple live on DVD, what a great idea!!!! Instant Compositions: TEAPOT IN RUINS: Intense over the top prog mathrock, footage of a live concert. I've always thought of these guys as being freeform but this is totally intricate. It would take forever to work something like this out! Like Frank Zappa but twice as fast! Now it's got the split screen, pretty cool, very Woodstockish..... the only person you can see onstage is the drummer. Now you can see the other guys far left and right! TSUNAMI MAGICK: Great footage of guitarist Kawabata Makoto. Yes, it's very badass!!! INVOCATION OF THE INTERIOR MOTIVE: They are joined by Daevid Allen, Gilli Smyth and guitarist Josh Pollock! Daevid immediately goes into long effected, (helium voice on acid) space poem about aliens and all important things!! This DVD is the ultimate treat/gift for those of us into this sorta thing. At around 13 minutes it goes into hyper-overdrive... chilling!!! Daevid Allen whips out some little guitar gadget, sonic space rock, the real deal! Music that's actually about something! STEVE AND MIQUETTE INTERVIEW: Interview with some fans!!! INVISIBLE: Vocals by Gilli. She sound like Bjork! Really cool creepy space poetry by Gilli and the gang! Daevid and Gilli have to be in their late 60's now but they are still kickass as ever. Their age makes them all the more important and relevant! VOICES: Another Gilli space poem!! Josh Powell has a megaphone he's playing the "voices" on! Now starts to go rock, over the top! Real magic created on stage for your pleasure! Goes into Daevid Allen English ditty, "maybe I should just let it go?" A short interview with Kawabata that's pretty funny and fascinating! ASTEROID OINTMENT: Daevid Allen's back to the Donald Duck on acid voice, or is it Sylvester the cat?! A bit silly, goes on a bit long but this sorta thing is the essence of Gong! Closes with the mighty improv!! A friend of mine said the Acid Mothers guys stayed at his house while they were in Austin and all they talked about was cowboy boots!!! Pretty funny! THE BONUS TRACK? A duet between Daevid and Gilli in their funny space voices with the band droning behind them. Then they all kick in for the chaotic whorl and wail! At 47:30 it goes into some boogie rock! Interesting multi-split screen action! At 50 minutes and it just keeps going and going... at 55:00 it goes into yet another space rock classic!? These songs are not listed on the DVD case?! I recognize this but not sure what it is? More Gongly over the top spacerock. Is it all improvised? It's understandable how two different bands from different era's can get on stage together and have the music fit together so perfectly. It's because this kind of music is more a state of spiritual awareness than musical styles or skills!!! For more information you can visit the Voiceprint Records web site at: http://www.voiceprint.co.uk.